1. Health secretary and 1981 batch Bihar cadre IAS Bhanu Pratap Sharma, has been shifted to department of personnel and training (DoPT) as its secretary. 2. CK Mishra, 1983 batch Bihar cadre lAS, currently additional secretary in the health ministry, has been elevated as health secretary. Mishra is the senior most among the 1983 batch secretary-empanelled IAS, which means he has to be appointed as secretary before any of his secretary-empaneled batch mate can be appointed. 3. Aruna Sundararajan, 1982 batch Kerala cadre IAS and secretary in the ministry of steel, has been appointed as secretary in the ministry of electronics and IT. 4. Aruna Sharma, 1982 batch MP cadre IAS and present secretary in electronics and IT ministry, has been transferred to the ministry of steel as its secretary. 5. Dr Amarjit Singh, 1982 batch Gujarat cadre IAS, will be new secretary in ministry of water resources, river development and Ganga rejuvenation. He will join as OSD immediately, and will take over secretary of the ministry when incumbent Shashi Shekhar retires on December 31, 2016. 6. 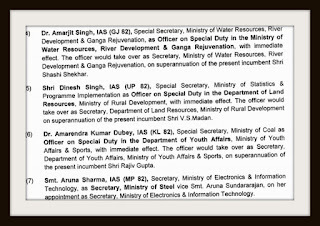 Dinesh Singh, 1982 batch UP cadre lAS and special secretary in the ministry of statistics and programme implementation will be new secretary in the department of land resources. He is joining as OSD immediately and will take over as secretary once incumbent VS Madan retires on August 31, 2016. 7. 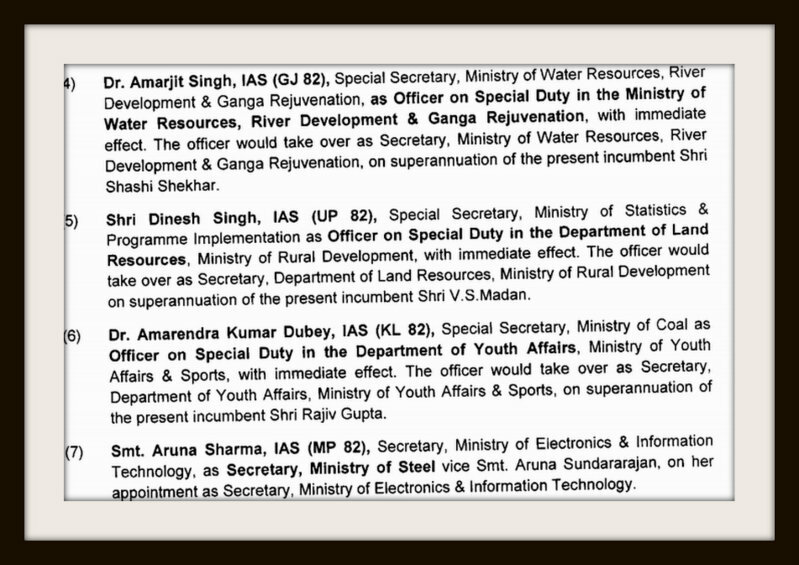 Dr Amarendra Kumar Dubey, 1982 batch Kerala lAS, currently special secretary in the coal ministry, will be new secretary in the ministry of youth affairs and sports. He will join the ministry as OSD immediately and will take over the charge of secretary when incumbent Rajiv Gupta retires on September 30, 2016. 8. Ms M Sathiavathy, 1982 batch AGMUT cadre IAS will be the new labour secretary once incumbent Shankar Agarwal retires on September 30, 2016. She will, however, join the labour ministry immediately as its OSD. 9. Amarjeet Sinha, 1983 batch Bihar cadre IAS and additional secretary in the department of rural development, has been elevated as rural development secretary. 10. NS Kang, 1983 batch Punjab cadre IAS, has been appointed as secretary and director general of National AIDS Control Organization (NACO) by upgrading the post. 11. BK Prasad,1983 batch IAS and additional secretary in MHA has been appointed as secretary, National Commission for De-notified, Nomadic and Semi-nomadic Tribe for two years. He turned 60 in May this year but was given extension. 12. Rajeev Kapoor, 1983 batch UP cadre IAS and director in Lal Bahadur Shastri National Academy of Administration, Mussoorie, has been given union secretary's rank by upgrading the post. 13. Latha Krishna Rao, 1982 batch Karnataka cadre IAS, has been appointed as secretary in the department of social justice and empowerment. 14. Smita Chugh, 1980 batch Jharkhand cadre IAS, now Member Secretary in Tariff Commission under department of industrial policy and promotion, will get the rank of a secretary as the post is upgraded. 15. Rakesh Srivastava, 1981 batch Rajasthan cadre IAS, presently in the cadre, has been appointed as secretary in the National Commission for Backward Classes.